The comprehensive research report on global mineral salt ingredients by Persistence Market Research assists the reader in chalking key growth strategies on the basis of vital insights on every market segment at a global level thus providing the much necessary value addition to gain tempo in the changing dynamics of the global market in the current as well as future market scenario. Credibility of the researched data and statistics lie in the uniqueness of the research methodology which ensures higher accuracy. In-depth assessment of the global mineral salt ingredients market is underpinned by an extensive research process that includes both secondary and primary research to obtain relevant numbers. The data collected undergoes several funnels of validation and re-examination at each step, as the research progresses. This ensures delivering value with data having higher degree of accuracy. The expert opinions of the market observers and the domain experts are extrapolated and the triangulation of these enables the analysts to arrive at a much accurate global market statistics. Global mineral salt ingredients market research report focuses on various developments, trends, opportunities, restraints and drivers that influence the growth of the global market. These aspects are analyzed across key regions of the globe thus portraying a global perspective of the mineral salt ingredients market. The reader can gain detailed understanding of the market dynamics across regions that can assist him/her to plan future moves from a growth perspective. Regions with optimum potential are included in this research study with which possible revenue pockets can be identified. Additionally, the research removes all the bias giving a realistic shape to the market insights. The research report on global mineral salt ingredients market includes a dedicated section describing competitive scenario. It covers key players and their standing in the global market. The section involves the strategies applied by the key players, their innovations, their product portfolios, developments and product evolutions, their area wise spread and future expansion plans, the mergers and acquisitions taken place, the market shares and revenues of these tier players, financials, key personnel, etc. This intelligence dashboard completes with the inclusion of the analysis of the various aspects of the key competition in the market. Competitive assessment has been done in a systematic way to enable the reader to draw necessary inferences that can be used to gain competitive advantage. The comprehensive research report on global mineral salt ingredients market offers valuable insights with weighted analysis. Every organization has its own integral research team, which strives to gather sufficient research data of the market. Persistence Market Research aims at doing all the heavy lifting by providing unbiased insights which can be actioned by the research team thus supporting in achieving their research milestones. Also, it extends 24x7 analyst support to solve queries regarding the research as the need should be. The report is systematically structured to deliver convenience along with a complete market intelligence package. Increasing emphasis on health and nutrition has changed focus of individuals towards mineral ingredients. Moreover, consumers are becoming aware regarding benefits of nutrients and advantages of appropriate nutritional intake though dietary supplements and food products. Additionally, mineral ingredients are gaining high traction across a wide range of applications that include dairy products, infant formula, cosmetics, agriculture, personal care products, functional food and pharmaceuticals, to name a few. With growing awareness regarding significance of mineral salt ingredients, their intake is expected to rise at a steady rate in the years to follow. There are several types of mineral salt ingredients such as potassium, sodium, calcium, phosphorous and magnesium. These ingredients have a specific function to carry out, for instance, calcium supports bone health, sodium normalizes and maintains body fluids whereas magnesium is vital ingredient that regulates nerve and muscle function and blood sugar level. This has triggered consumption of mineral salts ingredients across industries which is expected to push the global market’s growth few years down the line. 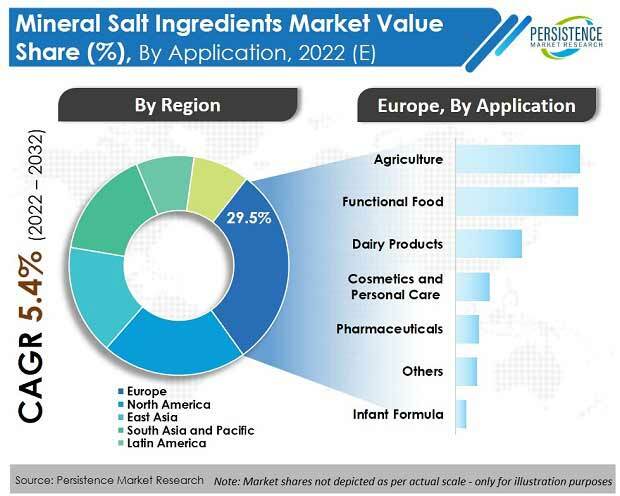 Persistence Market Research, after thorough analysis, has discovered that the global market for mineral salt ingredients is influence by several aspects, such as health awareness, demand for anti-aging medications, changing lifestyle requiring higher amount of nutrition and increasing demand for functional food. With these aspects, the global mineral salt ingredients market is expected to expand at a steady rate and is estimated to reach a market valuation of more than US$ 12 Bn by the end of the year of assessment (2026). Mineral salt deficiency is essentially lack of essential dietary minerals that are usually in the form of macro minerals or micro minerals or even trace minerals, essential for proper growth and health. Deficiency is usually caused due to impaired intake of mineral salts and poor diet. This can result in negative impacts on human body, such as weakness, insomnia, anemia, fatigue, anxiety, osteoporosis, goiter, depression and other minor problems on a regular basis. However, spreading awareness regarding malnutrition and poor intake of dietary supplements has pushed the consumption of mineral salt ingredients thus pushing the growth of the market, as compared to the earlier scenario when it witnessed slow growth. The trend of “prevention is better than cure” has positively influenced the demand for mineral salt ingredients and is expected to further its growth few years down the line. Moreover, with age, people tend to consume less owing to appetite loss. Vegetative diet does not necessarily offer a complete nutritional dose to maintain body metabolism and health. This might result in aforementioned deficiencies as age progresses. This can upsurge the consumption of mineral salt ingredients in the form of functional foods, medicines or supplements that can present potential growth opportunities for mineral salt ingredients in the global market. Mineral salt ingredients are used in various applications, of which functional food is the leading application area. Use of mineral salt ingredients enhances the functionality of the food product, making it high effective for the purpose it is processed. For instance, functional foods with high calcium or magnesium content can enhance body metabolism, bone health, muscle health and DNA regulation along with blood sugar level maintenance. Moreover, functional foods have gained high traction amongst all age groups owing to several health advantages they offer. This has spurred the adoption of mineral salt ingredients in functional foods even more. Demand for mineral salt ingredients in functional food is expected to rise at a rate higher than 7% in the coming years.